We have one of the largest enclosed premises in Ireland (25,000 sq.ft.) and have installed the only SIMI environmentally regulated spray booth/oven (that can accommodate a fully rigged articulated vehicle) in the west of Ireland. No matter how careful you are, dents and scratches somehow always manage to find their way onto your car. Our professionals use the latest techniques and the best quality car care products in order to fix these imperfections. We have always prided ourselves in stellar customer service and competitive prices. Cunninghams specialise in custom vehicle graphics, we only use the highest quality paints and we will work hard with you to create and perfect the ultimate custom design for your vehicle. View our photo gallery for examples. Thinking of getting a custom paint job? 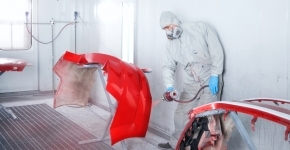 Is the factory paint on your car fading and in need of a new coat? We only use the highest quality paints and will work with you to find and match the perfect color for your vehicle. Our professionals use the latest techniques and the best quality car care products in order to retore your vehicle to excellent condition . We have always prided ourselves in stellar customer service and competitive prices. Our technicians are expertly trained and offer all types spray painting for collision repairs and paint work; we have a reputation of professionalism and unwavering quality built on impeccable and superior workmanship. With over 30 years experience our panel beaters provide a high quality panel beating service for all types of vehicles using the best body shop equipment in Ireland. Get in touch with us today for an obligation free quotation! Cunnungham Garage for all your Panel Beating, Crash Repairs, Vehicle Graphics, Sign Writing and Spray Painting needs. Welcome to Cunninghams Bodywork & Refinishing Tuam, Co. Galway. Specialists in all aspects and areas of motor vehicle bodywork repairs and refurbishment including Crash Repairs, Panel Beating, Sign Writing, Vehicle Graphics, Accident Repairs and Spray painting. Our service to you and your needs is what we pride ourselves on, with a 100% commitment to the individual client. Established for over 30 years with a vast amount of satisfied customers from all over Ireland and Europe, we probably have the largest premises in Ireland and also a fully enclosed environmentally regulated CV spray booth/oven that is 12,288 cubic ft so we can accommodate any form of vehicle refinishing from a fully rigged articulated truck to a family car. Cunninghams Bodywork & Refinishing has become one of the first companies in Ireland to achieve compliance under the new EU environmental regulation and is fully registered with the authorities to comply with the organic solvent regulations (SI N.o. 543of 2002) Contact Cunninghams Garage for all your Crash Repairs, Panel Beating, Sign Writing, Accident Repairs and Spray painting needs.